Spend this Valentine's day with your loved one in the stunning surroundings of the db San Antonio Hotel + Spa, indulging into the scrumptious special menus that shall intrigue your palate and be the cherry on the cake for your special evening. Bookings at the Gueliz can be done via email on gueliz@dbhotelsresorts.com or by calling 2350 3512. 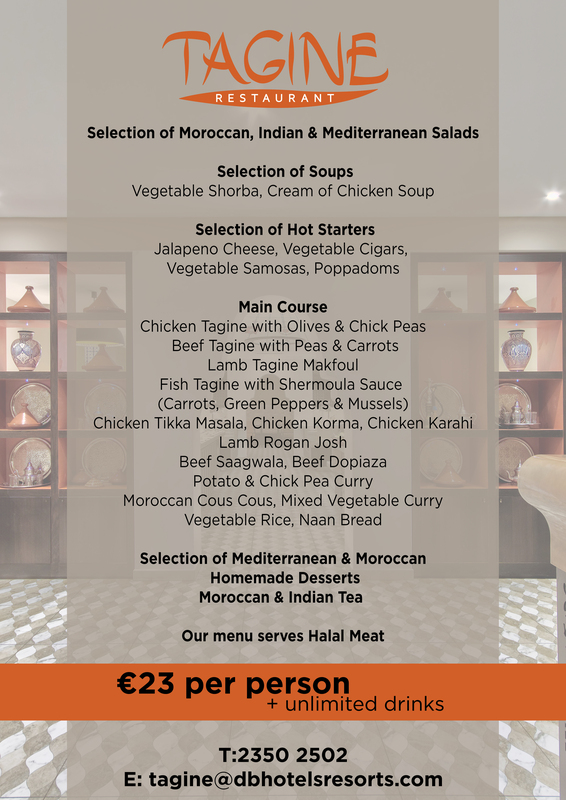 Your evening can take that special Indian & Moroccan twist in an intitmate setup at this stunning restaurant with an All-Inclusive Buffet at € 23 per person. Bookings at Tagine can be done via email on tagine@dbhotelsresorts.com or by calling 2350 2500. Your evening at dBistro can take the delicous Mediterranean twist with various seafood, meat and vegetables choices, sauces perfectly complementing your choice of spagetti, penne, farfalle or fusilli, which are also available gluten free or as brown pasta. Booking at dBistro can be taken by sending out an email on dbistro@dbhotelsresorts.com or by calling 2350 2500.